For over 35 years, our firm has been part of the greater Altoona, Ebensburg, and Johnstown areas, and that doesn't stop with legal services. At Edgar Snyder & Associates, we take pride in our wide range of community affiliations. Here are just a few of the many community service efforts we support in the Central Pennsylvania region. Our law firm sponsors the "My Holiday Wish" coloring contest for elementary-aged children throughout Western and Central Pennsylvania. 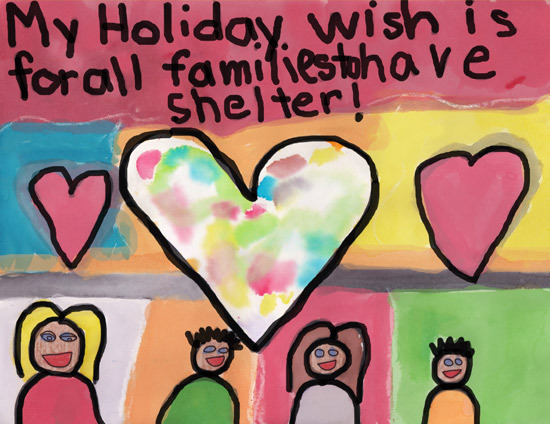 The winning students' schools receive a $1,000 donation and we feature their artwork on our law firm's holiday card. Cara Runyan, age 10, of Cara Runyan, of Clarion-Limestone Elementary in Strattanville, PA was named a 2014 winner. Over the years we've have many other winners from the Central Pennsylvania region. The "Words to Be Heard" scholarship contest is open to high school seniors in Western and Central Pennsylvania. Students present ideas for projects discouraging distracted driving and underage drinking among their peers. We've awarded over 60 scholarships since the contest started in 2007. Over $86,000 has been given to students to help offset the cost of college. You passed my school again. All right kids it's playtime. Hello? Hello? Are you okay? You're not supposed to text and drive dummy. But my big sister does it all time. Well I'd tell her to stop. Unless you want her to end up down there like you. Hey, do you want to get chocolate milk with me later? Johnny already asked me and plus he's a responsible driver. What's up kid you learn anything today? Yeah don't text and drive or Johnny will get the girl. 2014 winner Ryan King of Bishop McCort High School in Johnstown, PA created this texting and driving PSA. Because we help so many clients who have experienced the devastating consequences of drunk driving, our law firm strives to take a stand against this destructive practice. Our Don't Drink and Drive PSAs run on television, radio, billboards, and online throughout Western and Central Pennsylvania to remind everyone of the dangers of drinking and driving. "Take A Cab, We'll Pay the Tab" provides free cab rides home on New Year's Eve for people in Blair County who don't want to drink and drive. We are happy to say that since the program was established in 1991, not one drunk driving fatality has occurred in the county during New Year's Eve celebrations. Our law firm is proud to work with Hot 92 in Johnstown and Hot 100 in Altoona to prevent underage drinking and drunk driving during the prom season. These two hit radio stations help to promote prom safety in central Pennsylvania community schools through the BuzzFree Prom Pledge. Our Altoona, Ebensburg, and Johnstown offices are proud to be a part of the Central Pennsylvania community, and we provide sponsorships to local organizations throughout the year. Attorneys and legal staff also volunteer alongside friends and neighbors at many community service organizations and events. Leader of the Class on WTAJ in the Johnstown/Altoona area and Safe Graduation through WATM and WWCP. They both recognize local students' achievements. WALY-Warmth is a very special program that takes underprivileged children shopping for winter clothes. Since its establishment in 1991, the program has helped hundreds of children in need. Our Central Pennsylvania legal teams in Altoona, Ebensburg, and Johnstown are dedicated to serving their communities in a variety of ways. We're here to help if you've have been hurt in an accident, injured on the job, or need Social Security disability benefits.